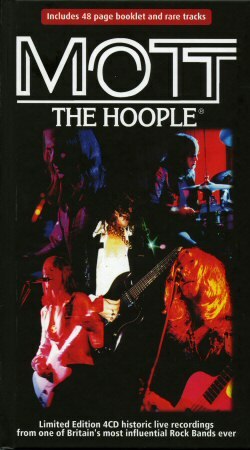 Mott The Hoople CD: "In Performance 1970-1974"
Mott The Hoople are widely regarded as one of the best live acts of the early 70's. For many years the only supporting evidence was their live album, recorded somewhat late in their career. Evidence from their earlier years was rather thin on the ground. Angel Air have done sterling work rectifying the situation, although their efforts have been diluted somewhat by a seeming endless stream of compilations and a couple of audience recordings that, let's face it, lack the sonic clarity of a properly recorded set. This collection goes a long way to rectify that, gathering together in one package the four best live discs in their catalogue. There's the Croydon set, recorded in 1970 but only released in its entirety in 2007. This is the night when they blew headliners Free off the stage and perhaps realised they were well on their way to becoming headliners. This after only fifteen months of existence. Then there's the Philadelphia set from late 1972, which was their very first headlining performance in the United States. David Bowie introduced them and joined them onstage for the encore. Disc 3 collects two Stateside shows, one from 1971 and the other a TV show from 1973, together with a few live-in-the-studio demos. The demos seem out of place here, but without them the disc would run significantly shorter than the others. Disc 4 is from The Hoople tour in 1974. When first issued it was an essential purchase, given that it was an almost complete recording from that tour. Now that the aforementioned Live album has been reissued this disc falls in the "nice to have" category, given that the band are suffering from a variety of ailments - Ian's voice in particular is sub-par, and Overend's vocal on Born Late 58 also suffers. Fans are rewarded with a lavish booklet which is an excellent and informative read. That said, for the fans who already bought the individual discs when they came out there is nothing new here, save the convenience of having all the recordings in one neat package. Whether that is enough to buy is up to the fan. Hence I've given it four stars rather than five.